mikevball has completed the grueling 26.2 ATR miles to full recovery! Last Friday I met with my Ortho, I am 8 weeks post injury, and have been in a boot for 2 weeks. I haven’t started any official PT but I’ve been doing ROM exercises. The Ortho said I was about 90% healed up and beyond any rupture unless something traumatic occurs and I should start to wean myself off the boot. I asked if I can wear a brace instead of the boot (athletic ankle brace - Mc David brand), he said yes. So I’m out of the boot and using the brace, my ankle is really responding with increase ROM and strength, I’m scheduled for my first PT on Wednesday. The Ortho said I needn’t come back unless I have a problem, just follow PT instructions and I should be running by July, 3 months after the injury. I’m amazed that the prognosis is so good. This site is so enlightening, because of this site I found an ortho that was progressive and is currently writing a paper on non-surgical intervention of the Achilles tendon rupture. Some of the modalities that I’ve been using are ROM, compression socks, contrast hydrotherapy, ultrasound, massage, and heat always followed by cold. I ruptured my Achilles Tendon while I was working out, I was in a kettle bell / boot camp class that I’ve been taking for 6 months. We were during 30 seconds of an exercise and then switching to a different exercise. The station that I injured myself was a sprint with the instructor adding resistance by holding onto a harness that I was wearing. This was the 3rd time around and it was the 2nd to the last exercise, I hit a wet spot and my left foot went into hyper dorsiflexion and I felt and heard a pop and I knew actually what it was. This was on Friday. The day of surgery I was laying in the pre-op area, I had talked to the anesthesiologist, the nurse, then the surgeon walks in and tells me the surgery had been pumped due to an emergency head trauma. He told me that we could reschedule in 2 weeks but he started talking about being conservative again. I wasn’t buying it!!! He said that by the time I had the surgery it would be 3 1/2 weeks after the rupture and it would have been 50-60% healed and he would have to go in and tear apart the healing, reconnect the tendon and then the rehab clock would start all over and that I would come out of the cast on the exact same day and start the exact same rehab process, but I would have had to deal with the surgery pain and discomfort. He sited several studies. I told him I wanted to see these studies and I would have to come to his office anyways since I had cut off the cast the night before surgery (it was driving me crazy). I went to his office about 1/2 hour later and he spent about 30 minutes talking to me about surgery vs. non-surgery (since he had nothing to do). He was very informative and showed me the studies and gave me copies of them. I was still apprehensive about going the conservative route since I’ve been doing these surgeries for years and had never been exposed to the alternative. So I’ve been in my current cast (it’s a posterior splint with a complete cast around the calf and ball of the foot (4" at each location so it’s open from mid calves to mid foot with a posterior splint), for 4 weeks with two weeks to go (13 days and a wakeup) but who’s counting? It seems that there’s not any standard rehab protocol, just whatever the surgeon is trained to do. I’ve been putting weight on the leg, the surgeon said I could if I tolerated the pain, to get used to walking in a boot without spending too many days on crutches. I’m not walking on it, since my toes are locked in a downward position. I’ve been using a "IWalk 2.0 instead of crutches and I find it so much easier to get around. 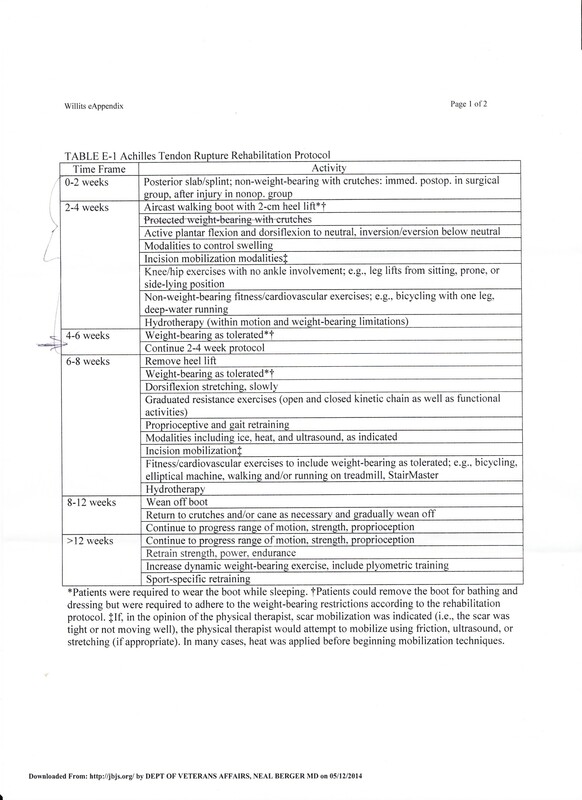 Reading about other ATR’s and the rehab has helped me get over some of my angsts about non-surgery. Great news!! I am still 8 days away from 2 shoes and very excited as well. Let me know how wearing the ankle support works. Curious if I will need the same thing mainly due to weakness. I wrote a few minutes ago about lack of US published research. I see that your os is writing a paper - are you in the US? You probably don’t know but is he basing his findings on a large sample? Yay, that’s great, but don’t get too confident or even UNnervous! Slide gradually toward a fast modern protocol, Watch Your Step, and stay incremental. According to the studies, you’re passing the peak window of rerupture risk. When you post here you use WordPress and at the top of your blog page you should see a menu running left to right. One of the choices to click on is Dashboard which takes to your own settings page. Including clearing posts like mine. I can’t remember more as I don’t these days keep an active blog. Interesting to see your new protocol. If you haven’t done so already, check out Suddsy’s blog for additional info around the Exeter and UWO work that may further help your knowledge. Good luck with the continuing recovery. Thanks for the input, I’m not familiar with Word Press, so I’m failing miserably at posting things. Putting the protocol up almost destroyed me mentally. I don’t doubt the dr misquoted the facts, I’ve worked with drs for over 25 years and they tend to slant the facts but it’s hard to call them on it because they are quoting a study I’ve never heard of, like I’ve said earlier I’m not a fan of the VA system. I’m just glad I received this blogs input and was able to advocate for myself, or I’d still be sitting here in a cast. Thanks again. Thanks for the tip Norm. On this occasion Mike should be able to clear my post from his blog’s dashboard. I must get round to reading the Wallace paper - I don’t come here so often these days. Good to see progress elsewhere other than Exeter and UWO. I wonder how many other ‘unsung’ ortho guys are trying for ambitious rehab protocols, as well as weaning away from surgery when practicable. Hillie, I’ve started just using “select all” and copy and fixing the problem that made the site choke - either a full URL or too many smikies or whatever - and reposting. I THINK Mike could tweak a setting somewhere to make the page more forgiving. Mike, I’ve looked at the “new” protocol you posted elsewhere, but I couldn’t go to reply to that post, not sure why! Anyway, that protocol seems to be identical to bit.my/UWOProtocol, the one my OS got from Willets et al (at UWO) back in 2009. Your copy has Willets’ name at the top, in fact. It’s an excellent protocol, op and non-op, though your Doc has slightly misrepresented its results, which you can see summarized at.. ./Cecilia/protocol and in full text on this site’s Studies and Protocols page. The non-op rerupture rates were very low and statistically indistinguishable from the post-op rates, but NOT lower. Also not as low as Wallace’s non-op rate with his 950 non-op patients. I’m not convinced that Wallace’s protocol is better than - or maybe even as good as - UWO’s, but Wallace’s technique is obviously better, and should be adopted immediately by the whole world, IMO. Oh!. Comment made - awaiting moderation because the full URL!! Mike, can you fix please? This is the new protocol per my new doctor. This is suppose to be the latest and greatest. It’s out of “The Journal of Bone & Joint Surgery”. According to my dr it doesn’t matter whether you chose surgery or non-surgery the protocol is the same. Following this protocol non-surgery’s re-ruputure rate is lower than surgery with none of the complications. I went to complete weight bearing in a boot today with PT starting next week. It was a great relief to get the cast off, but my foot was real ugly! Let me know if this link works, this is my first try at it. Thanks again. Hillie, I’m looking forward to some of the other benefits. My back is feeling better since I’m stretching and doing yoga everyday and my knees don’t ach as much. There’s got to be a silver lining, right! Good to hear about your senior specialist and a more aggressive rehab schedule. I don’t mean “aggressive” as rough and tough by the way. I do mean pushing for early mobility and giving you the tools to get there such as a decent modern boot, early physio, losing the crutches as soon as you can (keep them close for nervy or tricky spells though). In the different blogs there is lots of use of the word “conservative” but at my hospital (Exeter) it simply meant no surgery. Apart from that minor detail, surgical and non-op were on the same timeline, with almost identical results. Oh, and the age thing that you experienced. Same age as me and it makes no difference - actually, not quite true - I ended up fitter and stronger than before. Bonus! filosofoeduardo, great to hear you’re doing well with “the program”, too! Sporti, thanks for making me blush! Norm, you are simply astounding! Your contributions here are enormous and I cannot imagine how many ATR recoveries you have altered over the years due to your seemingly endless charitable time spent on this blog. Every time that someone asks me about the injury and my surgery, I begin by saying that if I knew then what I have learned now, mostly from this guy on a blog, I would have foregone the operation. Thank you for your time sharing your knowledge. Thanks again for the input. I received a call late Friday afternoon by the Chief Resident and he wanted to confirm what I had been told by the earlier dr. When he found out that I had been informed that they were planning on putting me in a walking cast he was confused. He’s currently writing a paper on ATR’s, that he said was going to change the way ATR’s were treated. We talked for about 30 minutes about “How I did it, Why I chose Non-Surgical, current cast angle and current activity level and how long I’ve been immobilized. He then said he wanted me out of the cast ASAP and into a boot on Monday. He was special ordering a boot and could I pick it up on the way into the clinic on Monday morning. Hell Yes! He has developed a new rehab protocol that brings the rerupture rates to less than surgical results! I will post them on Monday or Tuesday. Norm, Thanks again for pushing me to question the conservative medical thinking!!! BTW, in the old days, the old “conservative casting” with its scary ~15+% rerupture rate was mostly done to geezers. Jocks got surgery, “crocks” got stuck in casts forever. Casting worked badly, hardly worth imitating in 2014! 1) Based on the sample around here, I’ve seen no evidence that 60-somethings recover from ATRs any slower or worse than 20-somethings. After my first ATR, at 56, my own rehab knocked the socks off an undergrad in the local university sports-med clinic, faster, stronger, less pain. 2) Given the superior non-op results from much faster rehabs than his, (a) will he change his ways and go with the evidence, and (b) can he do better than “some guy on the Internet” at guiding you through the rest of your rehab, helping you catch up to the most successful rehabs (& grab some of their benefits) without going too fast or non-incremental and incurring those attendant risks? OK, maybe that was 2 Qs! I can’t believe it!!! My email to my surgeon was answered, he had his assistant call me and moved up the cast removal by one week (he said my long immobilization was due to my advanced age, 60. They want to put me in a boot on Monday but that they don’t have one in stock so they said they would put me in a walking cast until it comes in, luckily I have two boots at home (short and long from previous foot injuries), I just don’t have the wedges, but I can get them off amazon in two days. Then I can really start my come back!! Thanks for all the input, I plan on taking several of the protocols to the clinic on Monday and ask lots of questions. Are there any questions that I should definitely ask? I can think of a few put coming from the experience on this web site will help. Thanks again!!! 120+ km that should say above. Follow normofthenorth’s advice. He knows what he is talking about. I am even able add something to what he is saying, in support of early mobility and early weight bearing: I retore my achilles after five months after a standard operative repair (in Germany), then decided to follow what’s generally called the “UWO Protocol” here. I even ultimately dispensed with physio and doctor and so on (because they were not interested in working with me. I don’t necessarily advise this, but my case is a quite specific: I am very autonomous by nature (read also stubborn) and I did not want to repeat any of the flaws or stupidity done in the first run of rehab). The outcome: after less than five months I am clearly ahead of where I was after the operation, with more strength, mobility, endurance and NO pain at all. Riding a bike 120+ a week is no problem: the tendon is already good enough to do that much in a day. Follow what you find here and you’ll do fine, dr’s don’t know everything. But I would suggest ordering your own boot if you cut your cast off to protect it for the first 8 weeks. It makes working out so much more secure and safer. Way to go with the kettle bell! Well I tried to confirm with my dr about alternative protocols and PT, but I found out that all the drs that I had seen that first week had rotated out of the hospital. And none of the new ones were familiar with any ATR protocols. I asked them to read something and then get back to me, I’m not holding my breath. I then called and emailed the surgeon, himself, again I’m not holding my breath. I have “The VA” for insurance and have been very unhappy (pissed) with them for the last 5 years. But that’s a whole different subject. They drug test me every time I go in! Always has been negative and always will be. So I reviewed several of the non-surgical protocols and decided that it was time to do something. I split my cast, put a block under the heel and went PWB, I climb on the exercise bike and did 20 minutes then I did my kettle bell workout standing up (about 50 minutes). I have to say, I haven’t felt that good since before the ATR. I haven’t switch to walking PWB as the block is very unstable, I haven’t figured that one out yet, but I’m working on it. Mike, NONE of those super-successful new non-op studies stuck their legs in a cast for 6 weeks, and you shouldn’t either. Long immobilization non-op is associated with much higher rerupture rates, so Stop Going There! Check out …Cecilia/protocols for the range of “recipes” that yields the best results. It’s time for you to return the favor and steer your OS to the best evidence! And get into a boot, and exercise, & PT, too! 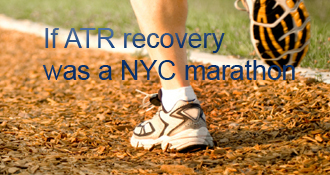 The one real benefit of ATR surgery is that it gives better results with bad rehab protocols! Non-op only produces great results in the “sweet spot”, and you’re not heading for it! mikevball’s AchillesBlog is proudly powered by WordPress and WPDesigner..